1) Peel the edges of the banana lightly,slice it in round shape with 1" thickness.Wash well and keep aside. 2) Heat 1 Tbsp oil in a non stick pan,put Mustard seeds and wait till it splutters.Add the curry leaves,sliced banana,salt,chili powder,turmeric powder and little water.Stir a little,cover and let cook for some time. 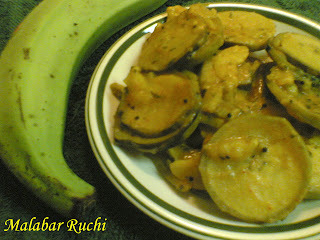 3) Add parsley.Stir now and then,cover and cook till done.After its cooked well,remove the cover and let all the water dry out.Put the grated coconut and coconut oil,stir well and remove from gas.Banana stir fry/vazhakai varavu is ready.It goes well as a side dish with rice and Dal. Alternative : Parsley is optional.I have used parsley as an experiment for "They Go Really Well Together #2 " and it turned out to be good.So this is my entry for the "Banana and Parsley" Theme. 1) Thaw the Puff Pastry Sheets in room temperature for 1/2 hour or till you can separate each sheet and spread it. 2) Marinate the fish with little chili powder,salt and turmeric.Keep for 15-20 minutes.Fry lightly on both sides and transfer it to a paper towel. 3) Put some oil in a non stick pan,add sliced onions and fry till transulant.Add ginger-garlic paste,crushed green chilies and fry till the raw smell goes off.Add finely chopped tomato,salt and turmeric powder,fry till the tomato is cooked well. 4) Add the fried fish pieces and toss lightly in the masala.Put 1 Tbsp of the ground masala powder and fry for some time.Check and adjust the taste accordingly. 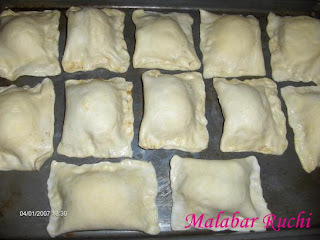 5) Unfold the thawed pastry sheet and cut each fold in to half.In that way,with 1 pastry sheet packet,you will get 12 pieces. 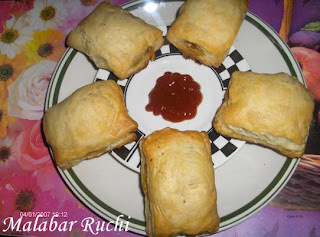 6) Put some masala and 1 fish piece on one end of each pastry sheet piece.Fold the other end to cover the masala and fish completely and press and seal the 3 edges with little milk,Like shown in the picture below. 7) finish this procedure for all ,arrange it on a baking tray.Preheat the oven to 350 degree,once done.Place the tray and bake till it gets puffed up and turn to light golden colour.That's it,Fish puffs is ready.Serve hot. 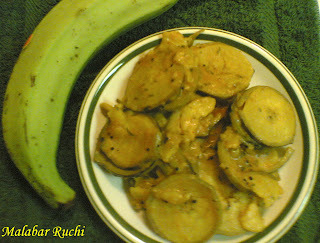 Alternative : Instead of fish you can use eggs / Any kind of meat / kheema / vegetables .If using any of these,cook before adding to the masala.For meat like chicken which cooks fast,no need to precook before adding to the masala.If Using eggs,boil,remove shell,cut it in to half and place each half instead of fish. 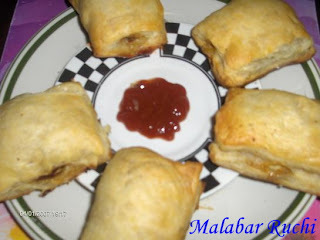 This Entry is for MasalaMagic's - Andhra Cuisine – Regional Cuisines of India May 2007. 1) Cut the edges of the bread,apply ghee on each slice and toast it(I prefer toasting instead of frying in a pan.Toasting requires minimal usage of ghee - for health reasons).Make 2-4 pieces of each slice. 2) Boil milk in medium low flame,keep stirring until the quantity becomes half. 3) Mean while make sugar syrup by adding little water to the sugar.The sugar syrup should be thick and sticky when taken in between two fingers. 4) Add the milk to the sugar syrup and boil for some time.Now this mixture should be little thick. 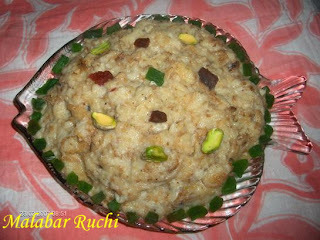 5)Powder the cashews,add it to the above mixture and let it boil for another 2-3 minutes. 6) Butter a plate or a vessel,place the bread pieces.Pour the above prepared mixture on to the bread.Let all the syrup be absorbed by the bread.Serve hot or cold as you prefer.Double ka meeta is ready!! This Entry is for WFLH's Monthly Mingle - Spring is in the Air. 1) If you are using fresh peaches,boil in 1 1/2 cups of water and 1/2 cup sugar.Then separate the juice and the peaches.Make peaches into puree. 2) Dissolve 1 tblsp gelatin in 3 tblsps water and then melt over hot water.Add 1 1/2 cups of peach syrup,2 tblsps sugar and any one food colour.Wet and grease a 4 cup capacity mould,put a glass in the center and pour the jelly in to the mould.Keep in the fridge to set. 3) Mean while, heat the milk and add the remaining 6 tblsp sugar.When the sugar melts remove from fire and cool.Then add the peach puree.Dissolve the remaining 1 tblsp gelatin in 3 tblsps water and melt over hot water.Beat the cream till light and fluffy.Pour the warm gelatin mixture in a thin stream in to the peach puree.Add the second colour.Lastly add the beaten cream. 4)Remove the glass from the set jelly mould by pouring warm water in the glass.Pour peach mixture in place of the glass and allow to set. 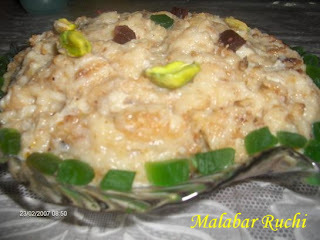 5) Unmould the pudding and decorate the way u like. 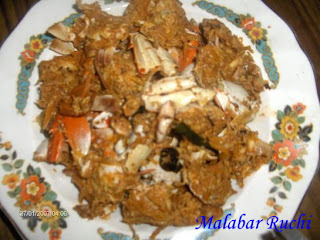 1) Marinate the cleaned crab with the above marinade and keep aside for at least 15 minutes. 2) In a pan add Oil and fry the cut onions till transulant.When done add ginger,curry leaves and green chili, fry for 2-3 minutes. 3) Now add the crab pieces with little water.Cover the lid and let it boil for some time.When the crab is cooked well and the water is absorbed,add the jeera powder,grated coconut and 1 tsp of coconut oil and fry for 2 minutes.The Crab Fry is ready.